"Have you ever had Grandma's chocolate?" Even though I didn’t grow up cooking or having someone directly teaching me how to cook, much of my early influences related to food comes from my grandparents. My aunt Linda and I have a shared sweet tooth and there’s been a few times since my grandma has passed away when Linda asked me whether I’d ever had Grandma’s chocolate. I wasn’t sure what she’d meant the first time because I’d had lots of chocolate growing up and, yeah sure, some of it was Grandma’s. I love telling this one story in particular. The kitchen in the house I grew up in was of decent size and laid out like a big square. There was no island, so the kitchen was quite open and on one wall, there was the door to the garage on the opposite side of the entrance to the kitchen from the family room. There was the stove to the right of the garage door, and turning the corner, the kitchen sink was under the small window facing the back yard. The last wall of the kitchen was to the left when you walked into the kitchen from the family room and it held the double-door pantry at one end and the refrigerator at the other end by the garage door, and in between the fridge and pantry was a small patch of counter space that had a single-door cabinet above and a pull-out drawer and single-door cabinet below the counter. This is as close as you’ll get to seeing me at four-years-old. This is about a year early. You get the picture. 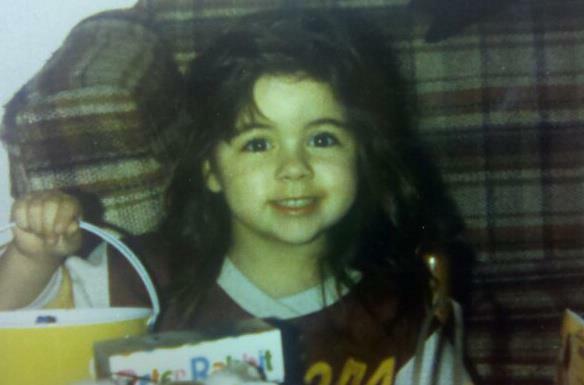 Before I do any further storytelling, do me a quick favor: Picture me at four-years-old. Have you got that image in mind? A four-year-old Morgan? Good. Keep that image in your head a bit. If you don’t have it, just picture 39-year-old Morgan only a bit shorter and not yet with glasses and bangs. That should suffice. Back to the actual story. One day, I was pulling open all the kitchen drawers (as you do), and I found the silverware, the ubiquitous junk drawer, the drawer the held rolls of aluminum foil and cling wrap. It wasn’t long before I found the holy grail. The golden treasure. Or rather, instead of gold, a familiar yellow and red bag that contained the true treasure. A bag of Nestle chocolate chips previously opened and now held closed by a clothespin. Really? A clothespin? In a drawer I could reach? It’d just be rude not to take some chocolate chips! I was a smart kid, though, and knew that I just had to take a few at a time and no one would be the wiser. I even knew that I could hold the bag shut with one hand while I release the clothespin with the other and quietly open the bag rather than let the clothespin wrinkling the bag and give away my position. At some point, though, I ended up going to the well too many times because I could even tell that there was a pretty significant decrease in the amount of chips left in the bag. I overheard my grandma saying to my mom once that she thought I must be sneaking in the drawer and stealing some chips. I was hiding in the pantry at the time of that short conversation, so I still can’t tell if it was a trap or not as I’m not sure if they knew I was hiding there. But, see, I was diligent and patrolled to make sure the perimeter was clear. I should have never been caught. I crept up to the drawer that I had renamed in my mind as the chocolate drawer even though I guess there were other things in it who knows these things. I slid the drawer open silently. I did my trick to open the clothespin without noise. I filled my tiny little hand with a whole bunch of chocolate chips and suddenly my grandma appeared around the corner from the family room. I could hear her working up to holler at me but I’d made a quick calculation that if I was already in trouble for stealing the chips, I may as well eat them. I shoved them in my mouth in one go and turned to make my escape out the garage door but my mom had just appeared there from work and I was trapped with a mouth stuffed with chocolate and no excuses to articulate. My grandma just hollered and went on about how those were her chocolate chips for making cookies. My mouth fell open in disbelief. I’d never seen a damn chocolate chip cookie come out of that kitchen. Despite getting caught and being lied to because seriously there were never any cookies, I love that there is a chocolate-loving-gene we all share. And it goes further back. Linda clarified what she’d meant when she’d asked if I’d ever had Grandma’s chocolate. My grandma would make for her kids something she’d call “chocolate” for breakfast. Linda said she’d make it every Saturday morning and began to describe it for me. After she told me what it was, I asked if she’d had a recipe for it. Linda said no. I decided to hack the recipe and made a version of Grandma’s chocolate for me and Cheri to try. Neither of us knew quite what to expect and Cheri was particularly skeptical. But it was delicious and new, even though it was an old creation. My grandma and grandpa are from Tennessee and since I don’t know anything of my dad’s side of the family, I have a tendency to simply describe my family as Southern (even though I could be a whole lot of some other origin on the unknown side of my family). Apparently, “chocolate” or “chocolate gravy” was a mainstay in the Tennessee mountains, spreading throughout Appalachia, into the Ozarks, and the rest of the South. Grandma’s chocolate is now going to be served at the Chocolate House in Muncie, Indiana for brunch. So, just what is chocolate gravy? It can be made in a couple of different ways but it comes down to the process that is followed by making any gravy: mixing dry ingredients with a liquid fat and thickening to the desired consistency. For the recipe I have developed, I use sugar, flour, cocoa powder, salt, cinnamon, and chipotle, and I mix this combination with milk and butter, vanilla extract, and more chocolate to finish. Yes, it is sweet, but it is not like chocolate syrup. It has a richness and body that leaves you satisfied without feeling empty/full from just having sweets. The biscuits I use are not sweetened and I have now honed in on a dairy-free biscuit that has won over omnivores in blind tasting. They make for a great canvas to pour all the chocolate gravy you can stand and, when paired with bottomless cups of Flying Rhino Coffee, the brunch hits a perfect balance. The idea of making something my grandma made brings me a wave of joy and pride I can’t always articulate. 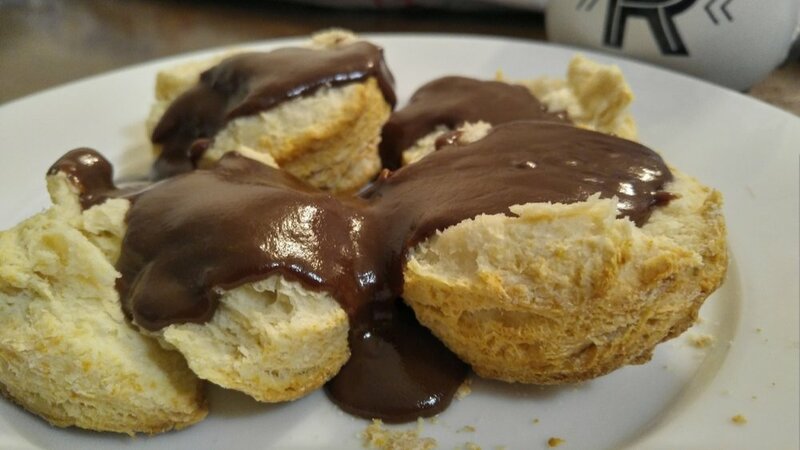 But it also opens a doorway to be creative and continue to evolve with different interpretations of chocolate gravy; for example, I am excited about developing a white chocolate gravy and pairing it with the dark chocolate gravy to make for a “tuxedo” plate! The white chocolate replaces the butter in a traditional gravy and I use buttermilk to add a bit of tang to the sweet gravy. I feel like Grandma would approve of this version, too. Come join us for brunch! If any and all of this sounds good to you, come see us for brunch! We will be offering brunch on Saturdays from 9a-2p. Our Chocolate House is growing more and more each day. We can’t wait for you and someone you unapologetically love to be a part of that growth and have Grandma’s chocolate, too!